using the suburban trains in Cape Town. There are four suburban lines from Cape Town to different parts of the Peninsula. The first line runs from Cape Town to Simonstown and follows the main road down the centre of the Peninsula. The trains all run above ground, and as there are no signposts on the streets in the suburbs you will have to ask the locals where to find the stations if you want to use a train. All trains tickets must be bought in advance at the station where you board the train. It's possible to buy single or return tickets at the same time if you intend to return by train. Always purchase a first-class ticket as second class tickets are non existent. Third class is not recommended as coaches are for the masses who use the trains to commute to work and back and cater mainly for standing commuters. These coaches often transport criminals out to make a quick buck robbing commuters between stations. For people wanting to travel to the southern suburbs using the Simonstown line, trains leave every ten minutes at peak times and travel as far as Retreat. As I understand it every second train leaving Cape Town at peak times goes as far as Fish Hoek. During non peak times there are two trains per hour with some travelling through Fish Hoek to Simonstown. At night, the last train leaves leaves Simonstown at 9.30 pm and Cape Town at 10.30 pm. The trip between the two stations is approximately an hour. There are three other lines running from Cape Town, to the Strand through the Cape Flats and on to the outlying towns of Stellenbosch and Wellington. 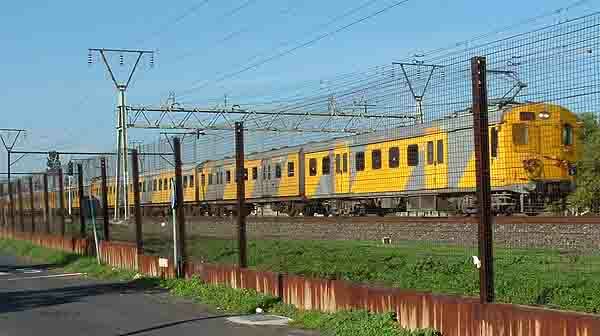 The Cape Flats section of the line is deemed less safe than the Simonstown line as it runs past and stops at stations near the townships that have mushroomed there. Visitors to Cape Town using the Cape Flats line should try and avoid the peak hour traffic on these lines. Getting onto the trains is a lottery and you will find yourself being pushed and squeezed as the masses force their way into the limited space in the compartments. You only need to see one train coming into Cape Town station at peak hour to see why they should be avoided. There are people hanging out of train doors which are unable to close due to the crowding. When the train eventually arrives in Cape Town people disembark from windows, doors and anywhere else they can find an exit. Many of the commuters do not have tickets and then jump barriers in Cape Town station to avoid being caught and being forced to purchase a ticket. The same applies in the evenings at peak hour when the reverse happens. In places such as the UK train travel is safe after dark but that is not the case here in Cape Town. Public transport after dark is not recommended especially when travelling alone. If you must use a train, travel with a group of people as there is normally safety in numbers, and even then stay away from third class carriages. Travelling alone on a train at anytime during the middle of the day could also be dangerous as often thieves board trains at quieter stations, hustle commuters before disembarking at the next station. Everything is not as bleak as painted above but it would be amiss of me not to warn potential travellers of the dangers of public transport. The brighter side of train travel is that the Cape Town/Simonstown line takes you through some of the historical places that line the route between Cape Town and Simonstown. A station such as Newlands is well known by sports lovers for its sports arenas where cricket, rugby and soccer are played. The rush to catch a train after a big rugby match creates much the same crush as you will experience on the Cape Flats in the morning. The big difference is that the bulk of the commuters are either happy or sad about the outcome of the match and the comments that fly between them on the station and in the train after the match are sometimes classic and not to be missed. 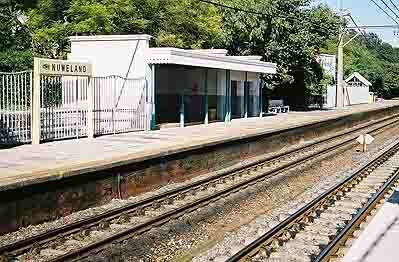 Rondebosch station was well known during the war years as the station where “Just Nuisance” boarded the train. Any sailor in Cape Town at that time could tell you a tale or two about him. Other stations such as Retreat are built where the Dutch after being attacked by the British way back in the 1700's finally succumbed and surrendered. Muizenberg with its lovely old station building is where the train starts the southern part of the journey travelling along the coastline just metres above the breaking waves of False Bay. When the sea is very rough water sometimes splashes against the train as it travels between Muizenberg and St James and also along the Clovelly coastline. The view of False Bay from the train is fantastic. As you travel through Kalk Bay past the quaint little harbour and around the coastline the vista of the Fish Hoek bay opens up in front of you. From Fish Hoek the train travels further south through Glencairn and past the sites where the British landed before marching around the Fish Hoek bay to take Muizenberg from the Dutch. From July onwards, along this stretch of coastline, you can see the whales swimming close inshore from your seat in the train. Simonstown is the last station on the line and should you be on the last train from town you will have a long wait before the first train of the morning leaves. Sitting in the train in the Simonstown station you can look out over Simonsbay and see the warships at anchor just a few hundred metres away. 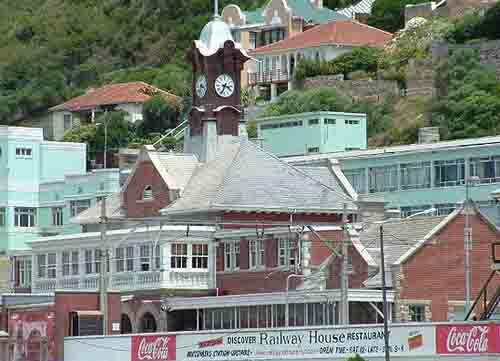 A walk through Simonstown's town centre with its old buildings will bring back some of the nostalgia of days gone by.